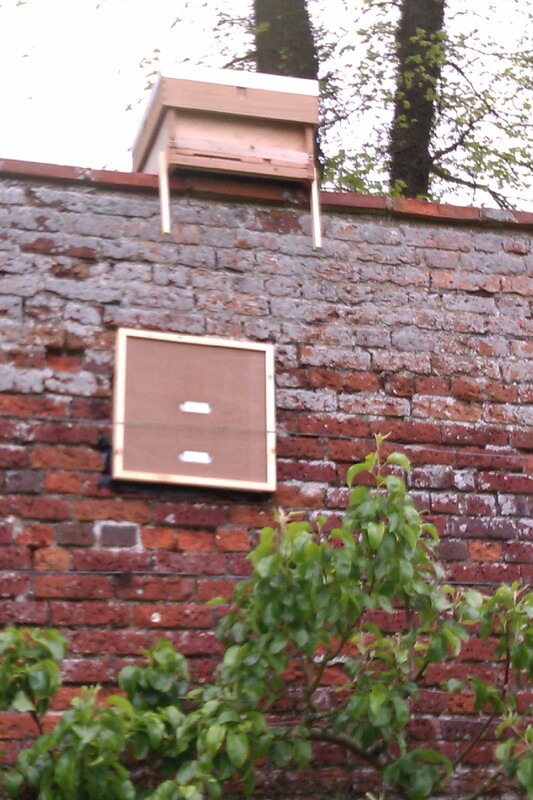 The set up in the picture is a crownboard with porter bee escapes. The crownboard has draft excluder around the edge and an extra strip of wood to increase the space within. The idea is that the bees in the wall can come out but cannot get back in. Because the bees are foragers they will be accepted in the hive above which is a small colony with this year’s queen. After 3-4 weeks the bees in the wall should abandon their location. Came down early to prepare for training session and found this! Note how the swarm has left the entrance clear and the colony within is coming and going as if there was nothing going on outside. Due to the adverse weather recently the field leading to the apiary is waterlogged and not suitable for vehicles. If you are attending this evening please park on the main road and walk to the apiary. You are currently browsing the Mid Bucks Beekeepers Association Blog blog archives for May, 2012.